Enjoy the opulent luxury of a country lodge built by the Dark Elves of an earlier, more expansive era—a walled estate with a grand multistory house, roof balcony, stable, storage shed, well, and room for a formal garden. Landed gentry, indeed! 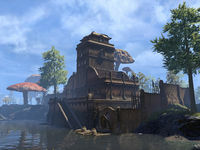 Amaya Lake Lodge is a large player house on the shores of a lake in southern Vvardenfell, to the north of Vivec City. The house is located on the future site of Pelagiad. This page was last modified on 19 November 2018, at 07:22.